The purpose of the association is to maintain, enhance and improve the remembrance of the history of those who flew on the HH-43 Kaman Helicopters in the service of the United States of America. The PRHA was proud to support the creation of this park. 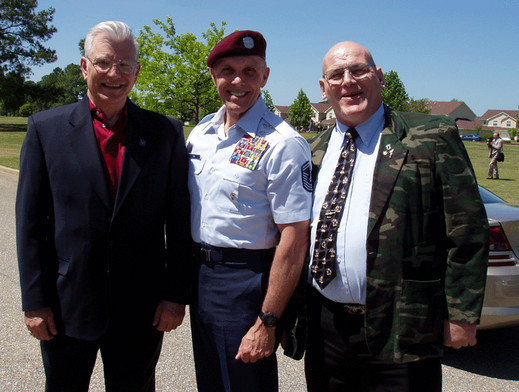 “Charlene and I, along with Bob and Vicki Gerstenberg had the honor of representing the Air Rescue Association and the Pedro Rescue Helicopter Association at the dedication of the Chief Master Sergeant Wayne L. Fisk Park at Maxwell AFB – Gunter Annex, AL on the 28th of April 2004. As you may recall the ARA and PRHA donated money toward the parks completion. The dedication was well attended and professionally conducted. It began with the National Anthem sung by TSgt Derrick Percival, an invocation by Rev Jim Salminen, Col, USAF (Ret), followed by Introductions from CMSgt Dave Hamel. This was followed by a special flag presentation by members of the 38th and 41st Rescue Squadrons. Chief Fisk then gave some very moving remarks followed by the unveiling of the monument to the Chief. Refreshments by the VFW Post 1349 of Prattville, AL concluded the days’ schedule. If you have never had the opportunity to visit the Enlisted Heritage Hall in Montgomery I strongly recommend you do so if you are ever in the area. The hall is very impressive and informative and stands right up there with the quality and quantity of exhibits found at the Smithsonian and the Air Force Museum in Dayton. Your dollars went to a very worthy cause and Chief Fisk wanted Bob and I to thank the PRHA and ARA membership personally for him. Staff Sergeant Wayne L. Fisk distinguished himself by gallantry in the all-volunteer Joint Chiefs of Staff-directed United States Army and Air Force military operation against an opposing armed force during the Prisoner of War Search and Rescue Operation at Son Tay, North Vietnam, on 21 November 1970. On that date, Sergeant Fisk, as a Paramedic-Gunner prepared to evacuate the ground rescue party and freed prisoners, flew deep into the heart of enemy territory in a bold night attempt to rescue American Prisoners of War. Throughout the entire mission, he manned his position with bravery and aggressiveness while maintaining the critical fire discipline necessary for properly conducting this humanitarian operation. During the return flight, he was a vital crewmember in the pickup of a downed fighter pilot. The personal skill and extreme courage displayed by Sergeant Fisk in this very hazardous rescue attempt contributed immeasurably to the ultimate effectiveness and tactical success of the mission. By his gallantry and devotion to duty, Sergeant Fisk has reflected great credit upon himself and the United States Air Force. Technical Sergeant Wayne L. Fisk distinguished himself by gallantry in the all-volunteer Joint Chiefs of Staff-directed United States Army and Air Force military operation against an opposing armed force on Koh Tang Island in the Gulf of Thailand on 15 May 1975. On that date, Sergeant Fisk was the Pararescue Specialist of a CH-53 helicopter aircrew which delivered a contingent of United States Marines to the Island. In spite of extremely heavy automatic weapons and rocket fire, the crew delivered the Marines to the small landing zone on the beach and provided suppressive cover fire which successfully allowed for the removal of wounded United States Marines from their perilous position. This courageous action aided in the safe recovery of the SS Mayaguez and its crew. By his gallantry and devotion to duty, Sergeant Fisk has reflected great credit upon himself and the United States Air Force.